Retractable patio awnings manufactured with Beauty-Mark marine grade acrylic vinyl canvas with powder-coated aluminum frames available in both manual and motorized models. This Copper Series patio awnings are available in a number of sizes, over thirty different colors and a variety of dimensions all incorporating Beauty-Mark Awning Fabrics that utilize fabric coatings that guard against, moisture, mildew, fading and soil. Additionally there is Isoray UV treated monofilament threads for strength and add to the patio awnings life. The dimensions of the patio awnings vary by model but typically run from 8 feet in width out to 24 feet wide with projections varying from 7 feet out to 12 feet. All these retractable awnings use a marine grade acrylic vinyl fabric with warranties from one to five years depending upon the make and model. The marine grade vinyl fabric is perfect for U.V. blocking, easy to clean and quite resistant to fading mold, and rot. A little cleaning with soap and water is all that is required to maintain their good looks. 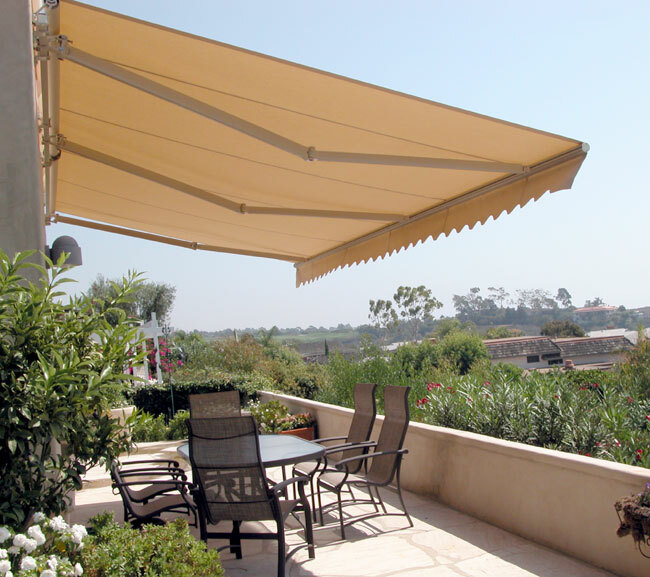 303 fabric guard is also a good idea to renew the weather resistance of theses awnings as well as renewing the U.V. blocking capabilities. Optional features include roof mounting kits and soffit mounting brackets as well as weather guards for added protection against the elements. Weather guards are particularly useful if living around salt water areas as theses help to reduce the salt build up on the fabric and reduce the number of times you'll need to wash off the fabric.